The King of the Seven Seas! Super-detailed action figure of Aquaman from the Justice League movie. Features two exceptional likenesses of actor Jason Momoa! In a screen-accurate costume, Arthur Curry includes alternate hands and his trademark Trident. The king of the undersea nation of Atlantis is as imposing as this articulated Justice League Movie Aquaman MAFEX Action Figure as he is in the Justice League movie! 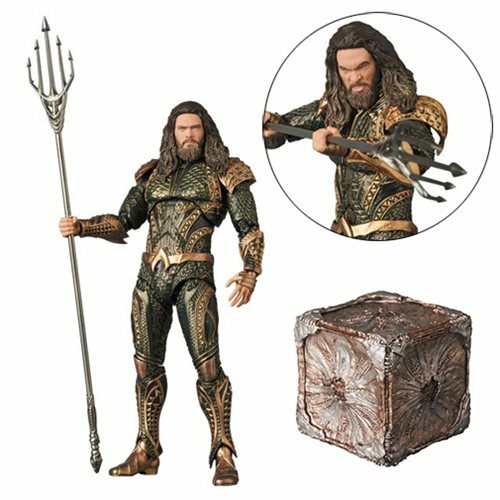 Featuring not one but two excellent likenesses of actor Jason Momoa, Arthur Curry, aka Aquaman, stands about 6 3/10-inches tall in a screen-accurate costume, with dedicated joint parts and various wrist parts that allow for exceptional action posing. Aquaman also includes alternate hands, his trademark Trident, and a movable figure stand!